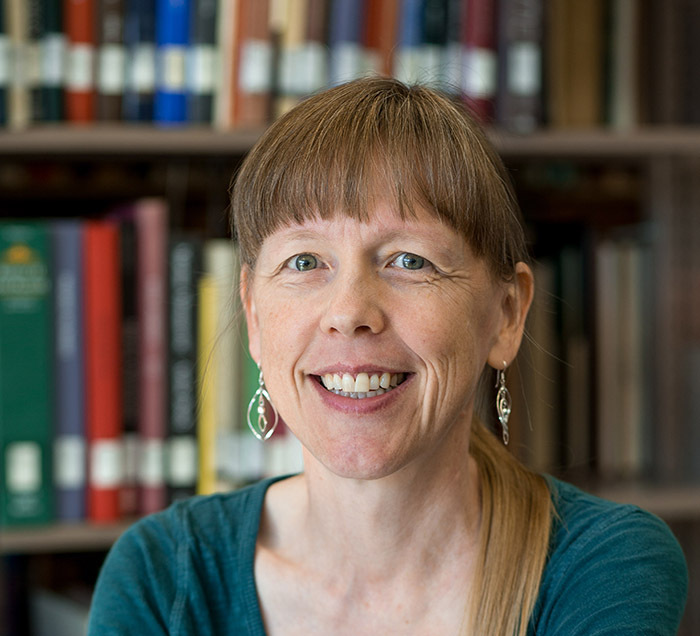 Dr. Jennifer Forsyth loves teaching a broad range of English classes, including courses on Shakespeare and other Elizabethan and Jacobean playwrights, British Literature, Principles of Literary Analysis, Intro to Lit, and Composition. In addition to teaching, she enjoys textual editing, which she has done for the Internet Shakespeare Editions and for the Norton Shakespeare (3rd edition) and writing about the senses and embodied emotions in early modern British literature. Most recently, Dr. Forsyth shared a paper on Shakespeare’s lilies and the smell of whiteness at the World Shakespeare Congress—a major international conference held only every five years—in the summer of 2016 in Stratford, England. But as somebody who believes adamantly in helping students design and perform their own research, one of Dr. Forsyth’s greatest sources of pride is not her own success but that of her students. For instance, in Fall 2016, Shubam Maini and Edward Probasco, both majoring in English at KU, presented papers at the Ohio Valley Shakespeare Conference. Both students were praised as excellent representatives of our department, and Shubam’s paper, “Bard Meets Bollywood: A Site of Resistance,” was awarded the M. Rick Smith Memorial Undergraduate Student Essay Prize for research. Drawing upon postcolonial theory, his paper examines Omkara, a contemporary Indian adaptation of Othello, analyzing it as a cultural hybrid and introducing his audience to the Indian cultural beliefs and myths that the film integrates with Othello’s themes and ideologies. And Shubam is not the first KU undergrad to receive the M. Rick Smith prize: two years previously, Lauren Sobczak (Sec. Ed. English, ’16) won that award for her work on teaching Shakespeare to students on the autism spectrum, a focus that she developed into her Honors Capstone project—which in turn won her one of the university’s prestigious Chambliss Student Academic Achievement Award Silver Medals. Two other students, Amanda Oswald and Amber Shoap Reifsneider (both Sec. Ed. English, ’15), also presented outstanding work at the Ohio Valley Shakespeare Conference that year. Dr. Forsyth serves on the university’s Undergraduate Research Committee for the Arts and Humanities and encourages students who are interested in pursuing independent research to contact her to see what support is available, both for conducting original research and for presenting at conferences.